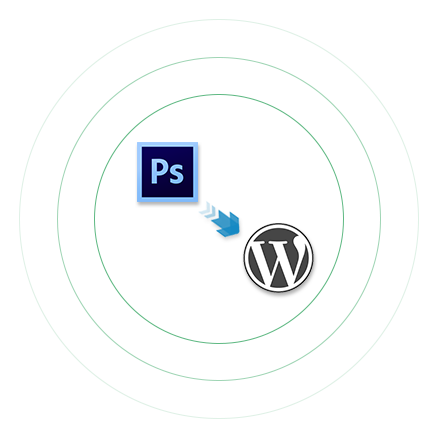 At Evince Development you get a wide array of PSD to WordPress Conversion services like WordPress Theme Development, Custom Plug-In Development, PSD to WordPress Conversion and WordPress Installation. WordPress has emerged as the most powerful blog publishing tool, which has revolutionized the blog publishing and content management. The user friendly interface of the WordPress platform allows you to make changes to content as and when required. Evince Development supply PSD to WordPress theme Conversion Services with affordable price. We just do not offer affordable prices, we believe in delivering valued solutions with our vast experience in PSD to WordPress conversion. We are known for top of the line Photoshop Document slicing services and offer a full range of Conversion services. Conversion from PSD to WordPress theme is quick and easy process. WordPress themes supports various custom WP CSS styles and Admin options. With WordPress themes high quality, customizable and appealing designs are possible. Making use of advance plugins, parallax page animations leads towards better conversions. We have programmers who are qualified and technically sound and they can offer you all PSD to WordPress conversion services. We offer you multilingual websites so that your business grows globally and multiple payment gateway options as well to make things easier both for you and your customers. Compatible with all sorts of social media like Facebook, You Tube, etc.